Tetsuo Hara + Blade Runner. I can't think of a better combo. I can... one that doesn't result in a permissioning error. Don't know exactly what that means but here's an alt link. 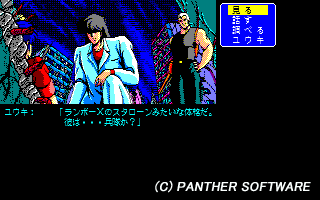 Man you really need to submerge yourself in pc88/98 emulation. The game libraries on there are the absolute boon for the Japanese futuristic/cyberpunk style they were fully into in the late 80's and early 90's. Even all the non action, adventure stuff is a fun way of learning the language if your still workin on that. - A robot named "Farts"